OnePlus’ first wireless earbuds are amazing for the price. We can’t think of another pair of wireless earphones we would recommend in its class, thanks to the Bullets Wireless’ excellent sound, build quality and strong wireless connection. 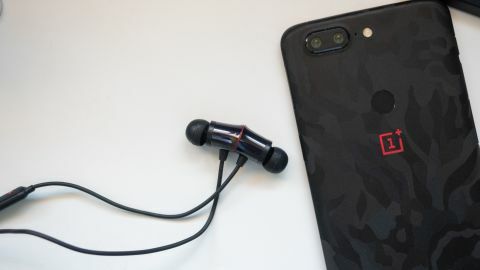 OnePlus is most known for its “flagship killer” phones like the OnePlus 6, but the company also makes headphones - the best example of which are the company’s excellent Bullets in-ears. For OnePlus, the next logical step is to create a wireless version of its Bullets headphones, and that’s exactly what they’ve done with the Bullets Wireless. For $70 (£70, about AU$124), the OnePlus Bullets Wireless offer an incredible value in the neck-bud headphone category. Sure, true wireless headphones are en vogue now, but tethered wireless headphones offer better battery life and signal strength for much less money. After spending a couple of weeks with the OnePlus Bullets Wireless, we came away extremely impressed by the well-rounded package that the company managed to put together. No, they’re not going to blow audiophiles away but the compromises that OnePlus has put together makes the Bullets Wireless an incredible value proposition, much like its phones. If the OnePlus Bullets Wireless look familiar to you, that’s because they draw a lot of influence from the popular Beats X headphone: Both offer a silicone neckband and long wires, though the Beats X’s wires are a bit longer for more head articulation. The neckbands on both wireless headphones also feature very similar layouts with a remote with integrated mic on the left earbud wire and the earbuds attach magnetically when not in use. Speaking of magnetic earbuds, the OnePlus Bullets Wireless have a useful party trick: the headphones automatically turn off when the earbuds are magnetically connected, and automatically turn on when disconnected. This means you don’t ever have to think about holding a power button to turn on and off the Bullets Wireless. It’s like having the convenience of auto on/off that truly wireless earbuds offer when being taken out of and placed in their charging case. However, it's worth noting that if you toss the headphones into a bag and the earbuds disconnect, the headphones will turn on - though they do automatically time out and turn off after a few minutes if no music is playing. The fit and finish of the OnePlus Bullets Wireless is very good, with glossy metal earbud housings that feature a subtle sunburst effect. The silicone neckband is lightweight and comfortable for long periods of time, since they take the weight off the earbuds like traditional wired headphones. OnePlus includes three sets of eartips and three sets of “wings” to help keep the earbuds steady when working out. The wings are extremely comfortable but we found the earbuds stayed in place just fine without them. Controls are located on the in-line remote, which lets you adjust volume and music playback. A long press of the play/pause button will trigger the voice assistant on your phone. There’s an additional power button on the left side of the neckband and a USB-C charging port as well. If you own a OnePlus phone, the Bullets Wireless support Dash Charging, which means you can quickly top off the headphones. 10 minutes of Dash Charging gives an incredible 5 hours of listening time. One of the only gripes we have about the design isn’t even related to the headphones, but its included carrying case: It’s made of silicone with a magnetic flap but the case is so snug that we have to awkward wrap the headphones and jam its cables into the case, resulting in a mangled mess when taking the headphones out. In terms of sound quality, the OnePlus Bullets Wireless offer a nice neutral balance - bass has good extension and impact, but never sounds bloated or uncontrolled; Mids are well represented with no bass bleed and highs are bordering on bright. Overall resolution is fine, but audiophiles should look elsewhere like the Sony WI-1000X, which is significantly more expensive but offers better drivers and aptX HD support. That said, for most people, the OnePlus' sound will impress. One of the best parts of the Bullets Wireless is its strong wireless performance. We never had the headphone as much as stutter in normal use and only managed to break the connection when we moved around several rooms away at home. With a direct line of sight, the OnePlus Bullets Wireless offer excellent wireless strength. Battery life is a bit of a let down with a rated 8 hours of listening, however. We found this claim just about right listening at 50% volume. At a time when truly wireless earbuds are pushing five hours on a charge like the Jabra Elite 65t, it’s disappointing OnePlus didn’t put a bigger battery in the Bullets Wireless.